Panasonic released a new firmware upgrade for its AG-DVX200PJ 4K large-sensor, 4/3-inch handheld camcorder. The upgrade, free to DVX200PJ customers, is labeled Version 1.25 and can be downloaded on the company's website. The Version 1.25 upgrade encompasses several feature improvements and additions, such as a fast scan mode for 4K24p, UHD29.97p, UHD23.98p, and UHD25p recording modes to minimize potential skewing. In addition, color reproduction at higher brightness levels is improved to accommodate ranges of skin tones, and potential black-dot noise in 4K/UHD has been reduced. The version also addresses playback image aspect ratio, which has been corrected so that an image is properly displayed in 16:9 when a 480i/576i SQUEEZE video is played. The ISO gain value display in high-sensitivity mode has also been improved. The DVX200PJ is a large sensor, multi-format professional camcorder capable of capturing 4K/UHD, HD, and SD, including cinematic DCI 4K 4096x2160. The camcorder is optimized for 4K/HD production, and incorporates a newly developed 4/3-inch large-format MOS sensor with high sensitivity of F11. 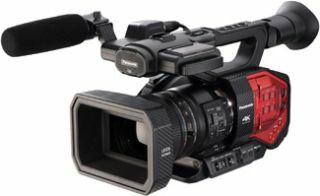 It also offers variable frame rate recording from 2fps to 120fps in 1080p mode, enhancing the camcorder’s utility in sports and VFX production. The handheld 4K camcorder also offers professional features including a newly designed Leica Dicomar 4K F2.8~F4.5 zoom lens (4K/24p: 29.5 mm ~ 384.9 mm, HD: 28 mm ~ 365.3mm, 35 mm equivalent) with shallow depth-of-field, time-code in/out, 3G HD-SDI and HDMI 2.0 (4K) video outs (4:2:2 10-bit video), dual XLR audio inputs and 10 programmable user buttons.